With busy lives we know it can be difficult to commit to lengthy hours as a volunteer. The hours shown after each position description indicate the hours that are available to work at ROC. Even if you can only come in once and a while we can still use your help! Dairy & Produce Pickup – Drivers to pick up dairy and fresh produce from JOCO food bank and deliver back to the ROC in time for the 3 PM distribution. Training provided. Tuesday and Thursday 2 PM. Grocery bagger – From a preset menu makes bags of groceries for weekly distribution. Tuesdays from 9-11AM and Wednesdays from 3-5:30 PM. Pantry shelf stocker – Under the direction of the warehouse manager break down large quantities of packaged foods and place in designated places on pantry shelves. Pantry stocker should be able to lift 20 pounds repetitively and up to 40 pounds periodically. Hours vary based on need and availability of goods. Distribution worker – Cover the pastry and bread table, produce boxes or condiment shelves to ensure they are kept filled and the clients are taking the designated amount of each item. Tuesdays and Thursdays between 3-6 PM and Saturdays from -10 AM – 12 NOON. 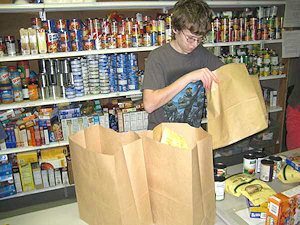 Pet Food bagging – Bag predetermined amounts of dog and cat food and brings to client bag distribution counter to include in weekly bags of food. Hours are flexible. 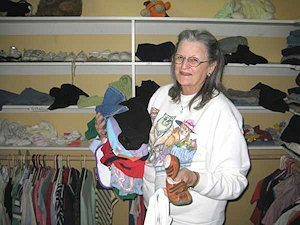 Clothes Closet organizer – Under the direction of the closet manager sort, fold and hang clean clothes and small household goods for distribution. Hours vary. Front Desk intake coordinator – Under the direction of the ROC manager, greet clients and manage input of client data into excel database. Training provided. Tuesdays and Thursdays 3-6 PM and Saturdays from 10-12:00 AM. Bag distribution counter – provides bags of groceries, meats and dairy products to families as the come through the pantry for their food. Tuesdays and Thursdays 3-6 PM and Saturdays from 10-12:00 AM. Delivery program – Deliver weekly groceries to home bound seniors and disabled. Route based on location of clients. Training is provided. Deliveries are done every Tuesday and Thursday between 1:30 and 6:00 PM.